I guess I’m becoming more and more helplessly romantic the older I get! My personal tip for everyone visiting Prague is a small bridge – I don’t even know if it carries a name – on Velkoprevorske Namesti. 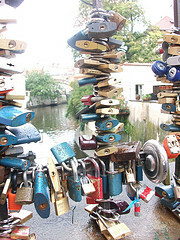 The railing is packed with love padlocks. Couples attach them to the bridge and then drop the keys in the stream below. In each padlock is either a date, or names, or both engraved. Locking their lives together, forever! Isn’t that just too adoring? It’s a new habit all over Europe, so I have heard. A novel by Italian author Federico Moccia started this hype in Rome that then spread rapidly to neighbouring countries and beyond. Apparently, bridges like “my bridge” in Prague can be found all over Europe: Rome, Paris, Copenhagen, even Cologne (Germany definitely being the least romantic place). 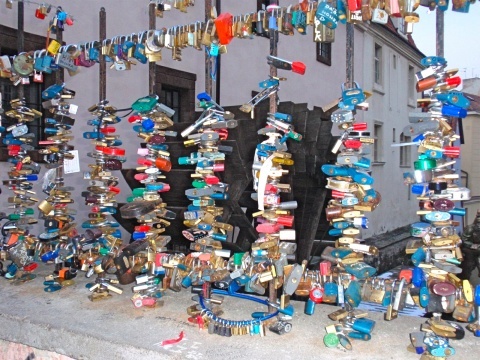 Padlocks in all shapes and colours, promising eternal love to Mr Right or Mrs Perfect in many languages, take over public fences, gates or bridges. Is this the secret key to an everlasting relationship or marriage? What happens when the once honeymooners grow apart and continue living separate lives? Will they go back and dive in the river to search for their keys to unlock their chained hearts? Most probably not. This concerns me a little.. and here I allow myself to be very selfish! I would like to go back one day to “my bridge”, the one with the water wheel behind it, the one that our driver showed us in the middle of the night when no one else was there, the one that symbolises romanticism to me. I would like to lock my love into a padlock and throw away the key while looking into the eyes of the man of my dreams… one day.